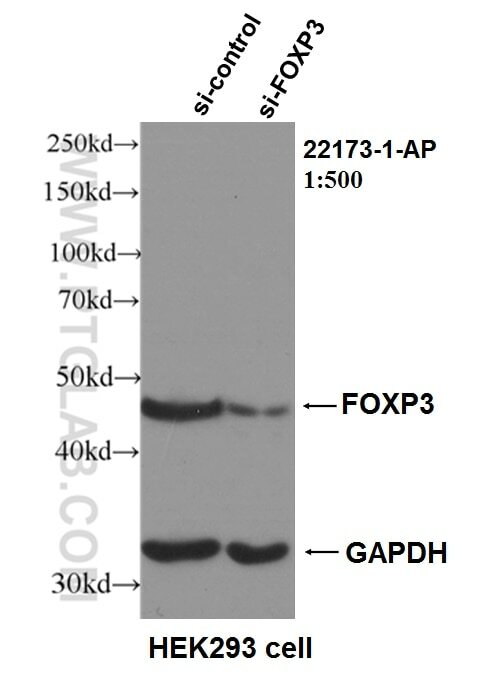 WB result of FOXP3 antibody (22173-1-AP, 1:500) with si-Control and si-FOXP3 transfected HEK293 cells. FOXP3, also named as IPEX, JM2 and Scurfin, is a transcription factor. FOXP3 plays a critical role in the control of immune response. Defects in FOXP3 are the cause of immunodeficiency polyendocrinopathy, enteropathy, X-linked syndrome (IPEX) which also known as X-linked autoimmunity-immunodeficiency syndrome. This antibody is a rabbit polyclonal antibody raised against a peptide mapping within human FOXP3.